Why Are Dogs So Hyper After Bathing? Why Dogs Are Hyper After Bathing? Unless you’re using a professional dryer chances are your dog’s still going to be damp after a bath, even after going through six or seven towels. And yes I’m sure like me you’ve been the victim of getting soaked by the dog shake many times. I think of that as their own form of justice, and I’m sure many times it’s well deserved. When your dog is let loose after a bath you might observe him rolling around on the ground. It’s just another way for dogs to dry off. After my dog has a bath she’ll run around the house and start rubbing her body up against the furniture. She also does it after she comes in from the rain, and it’s just a way for her to help dry off. 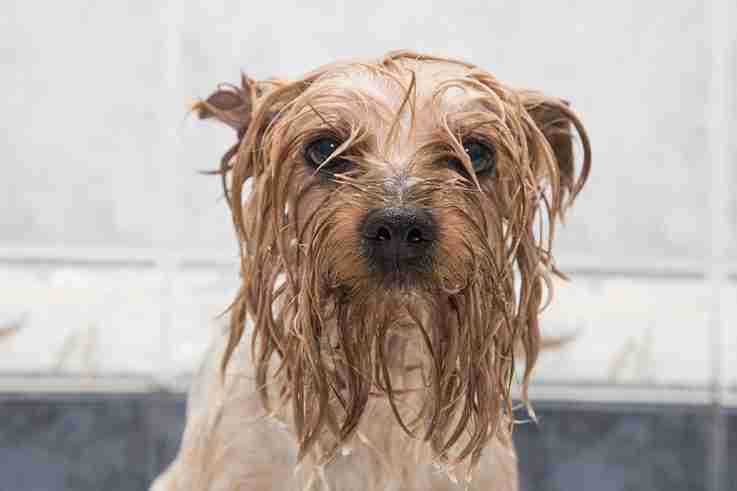 Feeling wet, being exposed to the odd smell of shampoos and soaps, and sensing the added weight of water on their fur can be unusual sensations for many dogs. While you may think that perfume-scented shampoo is delightful, your dog’s sense of smell is 10,000 times more than yours. Just imagine being dipped into a bath that pungent. Dogs really don’t think the same about the smell of perfume like you do. If your dog is not too eager to be bathed and can’t wait for the whole ordeal to be over, what you may perceive as craziness may simply be your dog’s way of saying he’s done. The cliche goes like this: Your dog knows it’s bath time, so the moment he sees you grab the towel and shampoo he is likely already taking cover under the bed. You get him to come out and then proceed as normal. Then, as soon as you open the bathroom door, he runs out so fast that his legs can’t keep up. As soon as you move in his direction, he runs the opposite way in fear of another bath. Surely, one good answer would be that your clean, sweet-smelling puppy is really glad the entire ordeal is over. Free at last, your dog starts to gallop around the house, ready to accept all your hugs and kisses, as well as the praise (and treats) for being such a good dog during the bath. Did you know that a study published in the Journal of the Royal Society Interface, wherein a wet 60-pound dog was forced to carry wet fur and it cost 20% of its caloric intake to evaporate it? Not all dogs get stressed from bathing. Some dogs, such as those that love water, may start getting hyper just after swimming in the pool, jumping in the lake or walking in the rain. In these cases, the dogs just seem to enjoy running and playing when wet. If two wet dogs are put together, very likely a vigorous after-bath party will follow. In these cases, it almost seems as if the mere fact of being wet makes some dogs feel refreshed and positively gleeful. If you have enjoyed learning about why dogs are so hyper after bathing, you may want to find out why dogs shake their toys!